Content is not just digital assets. Content must be curated, thought out, and part of a larger plan. It also must be dynamic. As a writer, I can create content. What is most needed, however, is the direction of content. By combining different voices and skills, a blog, a website, a social media channel, and a brand can become cohesive and exciting. Currently contracted with Girlfriend Collective, a sustainable women's activewear brand, to create and execute brand voice, all copy, and brand direction. I worked with Seattle agency World Famous to create a story for Alexis, a leukemia survivor who wanted to see herself as a cartoon princess. I worked with the agency Hum Creative to create a brand voice for the start up Bourbaki 13, including full site copy. Check out the website below by clicking on the image. Worked with agency Hum Creative to create an event that benefitted toy drive charities that serve the Seattle community. I created the name and messaging around the event, and worked with designers to create the copy for the website invitation. Currently contracted with German travel site Munich and the Mountains to write features, copy edit, and strategize their brand to bring more awareness to the premiere travel and inspiration destination for Alpine wanderers. Below is an example of a script I wrote for the Lively "Be Here" campaign that I created and managed. The campaign was designed to bring warmth to a tech company by appealing to the emotional side of music. It places Lively in the larger narrative of the concert experience, and invites consumers to remember why shows should be documented. The video below was a first draft, with our videographer narrating, using found footage. Because of my background in music journalism, I was in charge of direction for our artist interviews. In this role I conceptualized with our video team, and executed. I wanted the interviews to show artists behind the scenes in a way that fans would find captivating. We interviewed artists in our bathtub, across the street at our favorite dive bar, by the train tracks, and never with the same questions. 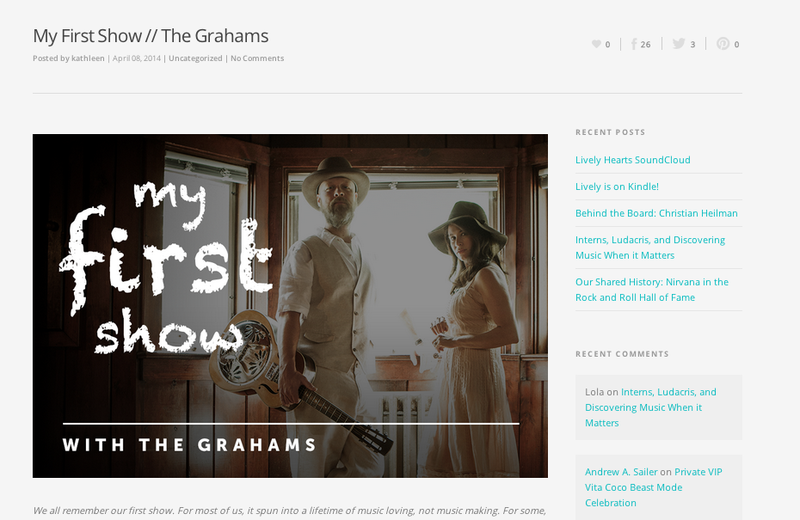 I wanted the Lively newsletter to be interactive; to be exciting, informative, and compact. 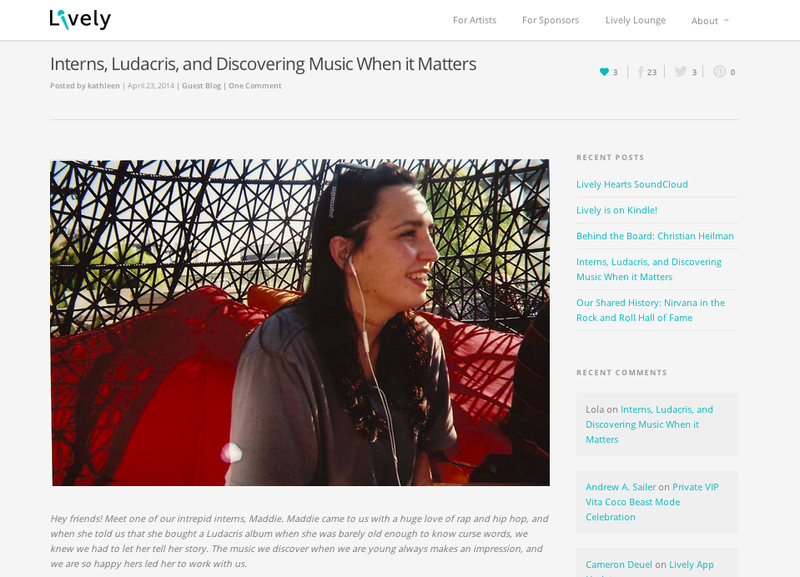 In a bi-weekly newsletter, I gathered the top stories of the past two weeks and worked with our design team to create The Music Note. In one special post-SXSW newsletter, I realized there was too much information to be put in an e-mail. 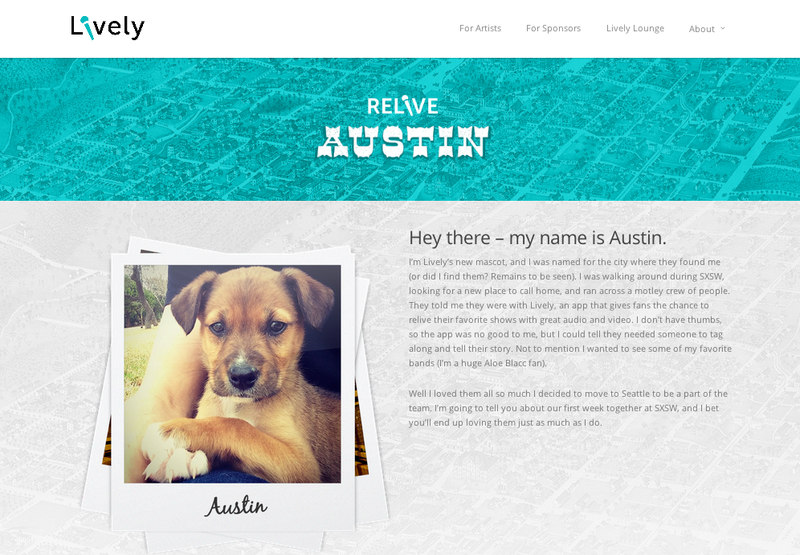 This lead me to curate a special website newsletter with the SXSW story being told by the rescue dog we found at the festival and named Austin. Tess Henley came to the Lively Lounge and blew us all away with her powerful voice. Hear and see it for yourself. Brooklyn's TEEN delivers heavy pop a la Roxy Music with a palpable fierceness. Their set in the Lively Lounge last week was wonderful, and if you head over to our YouTube, you can see our interview with them while they slayed at darts. One of our favorite new bands that has passed through the Lively Lounge? LA's Grizzly Business. What started as a cover band is now making its own catchy hooks, and you'll want to hear it first. very happy when they love us right back.